By Scott Gilfoid: WBC heavyweight champion Deontay Wilder (34-0, 33 KOs) could be facing the capable 6’5” Andrzej Wawrzyk (30-1, 16 KOs) in his next voluntary title defense on September 26th on Premier Boxing Champions on NBC, according to Dan Rafael. Wawrzyk, 27, is an experienced heavyweight who has previously fought the likes of Alexander Povetkin, Fran Botha and Denis Bakhtov. Trainer Peter Fury says that Wilder’s management reached out to him for a fight between Wilder and unbeaten Hughie Fury (16-0, 8 KOs). After initially saying that the fight would be in just 4 weeks, Peter said that he would only agree to the fight if they were given a full 8 weeks of training. Currently, there is 7 ½ weeks to go before Wilder’s fight on September 26th. You can draw your own conclusions about why 7 ½ weeks wouldn’t be good enough for Hughie to take the fight with Deontay. Come now, Wawrzyk isn’t a bad option for Deontay to fight on September 26th. I mean, Wawrzyk has experience against Povetkin, Danny Williams, Botha, and Bakhtov. He’s also beaten well-known fighters like Tomasz Bonin, Lee Swaby, and Paul Butlin. Those are all fighters that are well-known. David Haye fought Bonin. Butlin has been in there with Dereck Chisora. Wawrzyk definitely has experience, and he’s a goiod option for Deontay to take in a tune-up fight. I see Wawrzyk as another Hughie Fury type opponent. I know Deontay wouldn’t take any heat if he were to get the Hughie fight. Well, he shouldn’t take heat for fighting the equivalent of Hughie in 6’5” Wawrzyk. They are identical fighters in terms power, size, skills and fighting style. The only difference is one guy is connected with the Fury family, and for that reason he may eventually get a world title shot in the future. I see absolutely no difference between Hughie and Wawrzyk. They virtually possess the same career outlook in my view, and both are dealing with a complete lack of punching power. Wawrzyk defeated Patryk Kowoll this month. 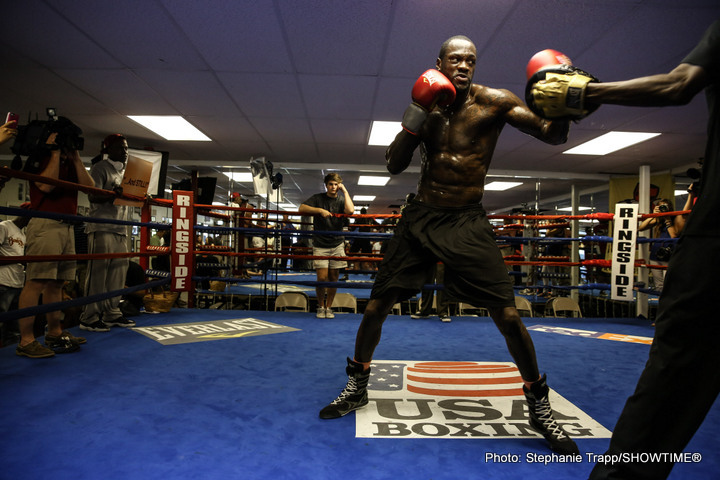 Deontay just needs rounds right now to get him ready for his fight against Povetkin next year. Wawrzyk is a good serviceable heavyweight that has the mobility to stay alive in there for a number of rounds before Wilder eventually smashes him to bits. There’s nothing wrong with Wawrzyk for a tune-up. I mean, you can’t expect Wilder to select a bruiser for a voluntary defense. Wawrzyk is perfect for what he’s trying to accomplish with his next fight. He just needs someone that will give an entertaining fight for the Premier Boxing Champions viewers on NBC on September 26th. I believe that Wawrzyk will do a good job of accomplishing that. He’s got the mobility to stick around in this fight, and he’ll test Wilder’s ability to hit a moving target. I see it as a really good warm up to get Wilder ready for the likes of Wladimir Klitschko, who moves quite well for a fighter his size.